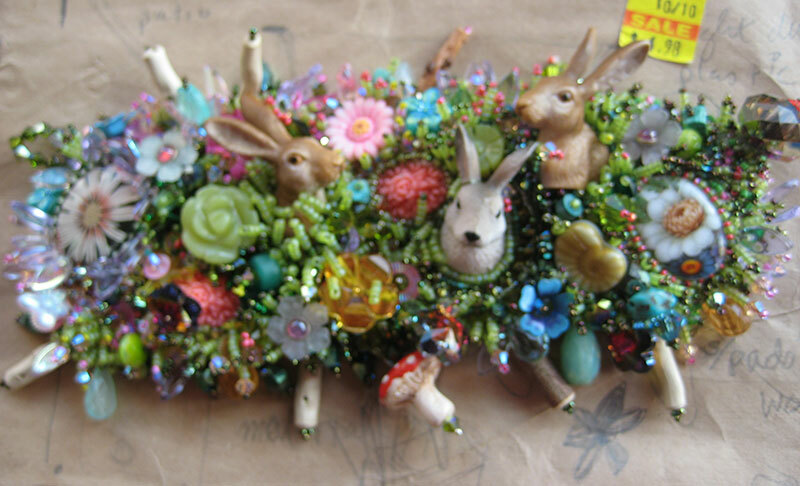 There are a few polymer mushrooms and such in this beaded bracelet by Wendy Malinow. 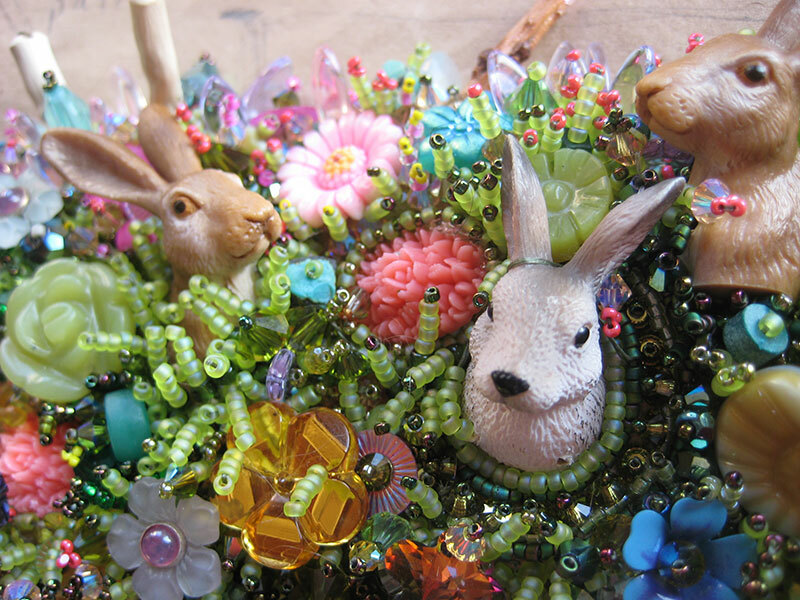 The rabbits are beheaded toys surrounded by seed beads and crystals. It’s a sumptuous seasonal piece that’s irresistable. Here’s a close-up. Wendy grew up in this area of Oregon where such moss and wildlife and dewy sparkling flowers are plentiful in spring. The polymer patchwork rabbit is from Lisa Pavelka who is just back from Petra Nemravova’s Fimohrani Event in Prague. 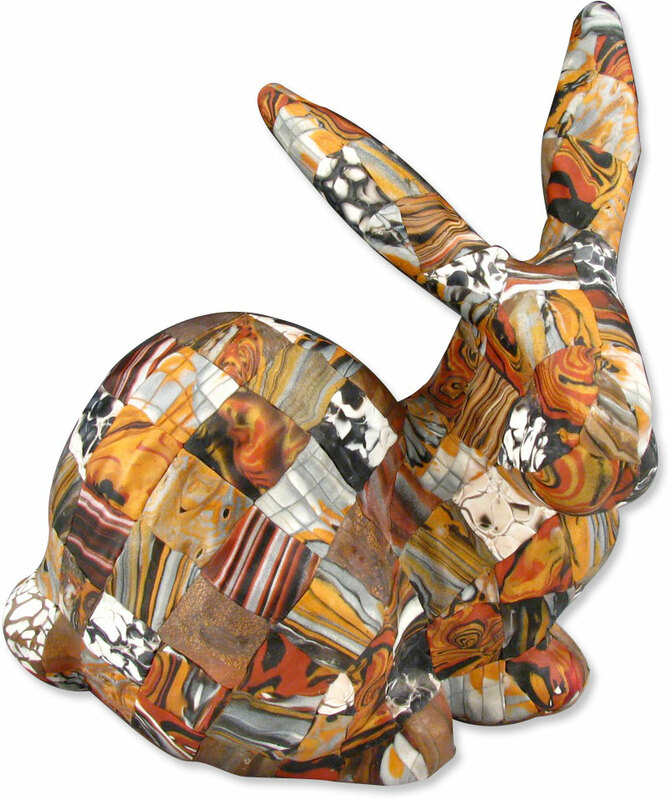 Lisa’s rabbit is covered with mokume gane cane ends. It feels like spring and I wasn’t quite ready to give up the holiday so let’s have another day of celebration. Beautiful! I so love Wendy’s work. Thank you Cynthia for this post! I love Wendy’s piece. I just checked out her website and feel totally inspired! Love the bunnies! My granddaughter was disappointed we couldn’t fit egg dyeing into our busy schedule and it rained all morning here. We are going to do it next weekend! Only you, Wendy. It’s fantastic!